"They who supply the seed will find that it multiplies, increasing the harvest of righteousness. for they administer public benefit and see to the needs of the Church. Their generosity overflows in much gratitude to God." God has given us many gifts and calls us to use those gifts to build up His Kingdom. Our faith identifies us as stewards and gives us a relationship with God. Many of these gifts are given for our needs; others are given for the needs of others. 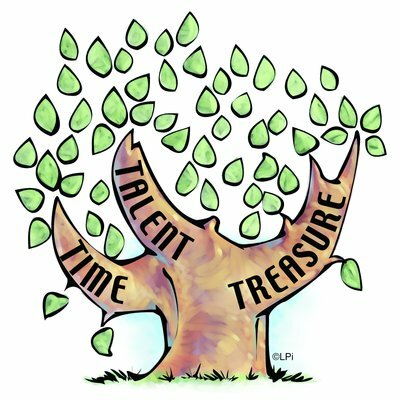 Stewardship is a ministry by which we nurture and share our gifts of time, talent and treasure. There are many ways to give of your time and talent. The "Ministries" tab on this website lists all of the parish groups and ministries that you may consider becoming involved with. Please call the parish office at 440-886-4434 for more information, or click the stewarship icon below, download our "Parish Interest Form," and return it to the Parish Office. Donating to St. Bridget of Kildare Parish and/or School in lieu of flowers when handling funeral arrangements. A charitable IRA Rollover to St. Bridget of Kildare Parish upon your death to let your legacy live on. Funding a scholarship to assist a struggling school family with tuition. Donating to a specific fund, such as the Liturgical Fund. The Liturgical Fund is used to help decorate and create art and environment for the church during each liturgical time (i.e., flowers, plants, vases, altar cloths, vestments, fabrics, banners, candles and other decorations). It is also used to purchase sacred vessels and other items needed for liturgy. Any individual or parish group is welcome to contribute money to this worthy fund. You may simply donate, or you may give in memory of a loved one, in honor of a blessing received or prayer answered, or in thanksgiving of a wedding anniversary or other special occasion. Simply fill out the “Liturgical Fund” envelope located in the back of the church and deposit it in the offertory collection basket, or drop it off at the rectory office. Donations to the Liturgical Fund are listed in the Sunday bulletin. Donating to a specific Parish ministry, such as the Good Samaritan Ministry. Please call the Parish Office at 440-886-4434 if you would like more information. Thank you for your generosity. Contributing online is an option through your online banking "automatic bill pay" method. There is no paperwork to complete at the parish office. Please click the icon below to learn more.